The procession of the Black Nazarene is annually done in the Philippines on three occasions- on Good Friday, New Year’s Day and January 9. The Black Nazarene is a life- sized dark wooden sculpture of Jesus Christ dressed in a maroon tunic and carrying a wooden cross on one shoulder. The statue of the Black Nazarene is placed on a carriage or a “carroza” while traversing the assigned processional route along the streets of Quiapo district in Manila. 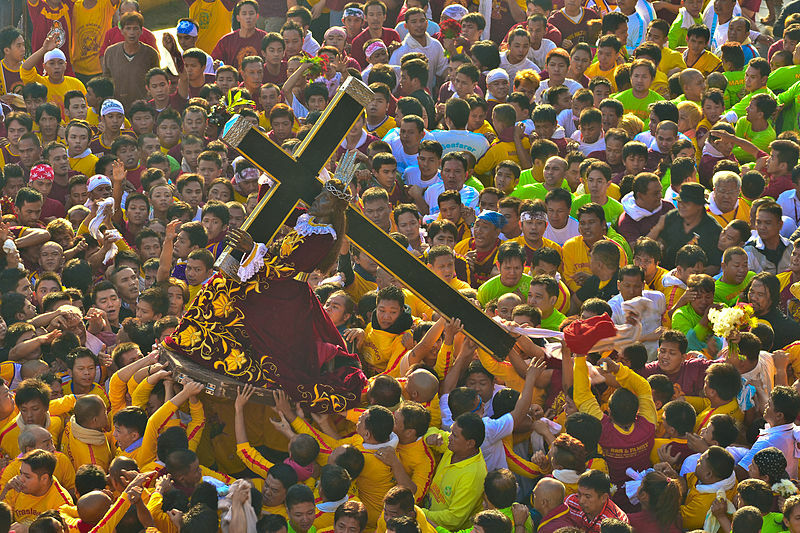 Many devotees claimed they received miracles from their annual sacrifice or “panata” to Señor Nazareno . 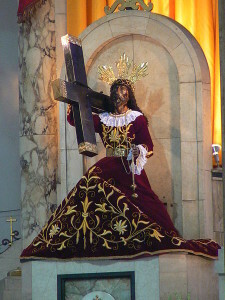 In present time, the statue is in Quiapo Church. Then it is brought out of the church at an earlier date to a location such as Quirino Grandstand in Luneta Park where the procession will start. The statue of the Black Nazarene is brought out for public veneration early morning to commemorate the transfer or “traslacion” of the image to the Minor Basilica. Classes in schools near Quiapo, Manila are suspended so that the festivities may not be an obstruction to students while allowing more people a chance to participate in the celebration. The January 9 is the much anticipated time amongst the three occasions when the statue of the Black Nazarene is brought out. It is a big Catholic tradition in Manila based on the number of attendees. The attention accorded is not only by the Filipino devotees but also by the international communities. The event is attended by millions of devotees. Barefoot devotees flock to the streets of the city of Manila in the Philippines to attend the Feast of the Black Nazarene. The event is attended by millions of devotees each year. Barefooted devotees flock to the streets of the city of Manila in the Philippines to attend the Feast of the Black Nazarene. In 2013, an estimated 500,000 devotees walked barefoot during the procession from about 9 million who attended coming from the religious and faithful, and with many foreign tourists also witnessing the occasion. Because of a large number of attendees and international recognition to this religious activity in the Philippines, the city of Manila proposes to make January 9 an international day of pilgrimage. READ Manila declares Jan. 9 a special holiday. 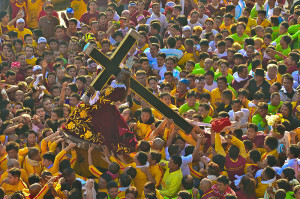 In the latest mammoth celebration of the feast of the Black Nazarene in 2014, there were about 5.5 million attendees as estimated by the Philippine Red Cross. Due to the heavy volume of people, there were 2 casualties as the devotees pushed and shoved just to have a chance to go near the statue. Some even tried to climb through the carriage to hold the Black Nazarene. There were also hundreds of devotees who got injured as the procession lasted for 19 hours traversing at a snail’s pace from Rizal Park and to the Quiapo church which is just about a kilometer away from the national park. As a tradition, the statue of the Black Nazarene is mounted on a reinforced carroza or carriage. It is wheeled out from the Quiapo church or an assigned landmark while surrounded by devotees dressed in maroon shirts at a designated time, usually in the morning. Most of these devotees walk barefoot as a sign of penance and to re-enact Jesus on his way to Golgotha. The Feast of the Black Nazarene starts with a mass at the Grand Stadium of the Rizal Park where the devotees have assembled even a day before the procession. Most devotees wear similar T-shirts with the image of Jesust Christ emblazoned. Two thick and sturdy ropes secured to the statue and the carriage is pulled by the devotees or the bearers from the church or the landmark and through the assigned streets where a million devotees including women are on the standby. The devotees are defined by their strong wish for an immediate and direct access to divine intervention and help. They mainly pray for a better life, good health, healing, and success. This is why most of them even risk their lives and limbs just to get near the image of the Black Nazarene, touching and kissing the statue, having their towels or any clothing wiped into the statue. Some devotees follow the procession until the statue is returned to Quiapo church. The awaiting devotees on the streets throw either towels or handkerchiefs or any clothing towards the yellow clad marshals escorting the Black Nazarene. The marshals wipe the clothing on the statue and throw back the clothing to its owner. Some devotees on the ground are even carried into the carriage to the statue to personally touch it and wipe their towel or handkerchiefs to the statue. It’s amazing how after doing the ritual, the devotees are carefully carried and sent back to the streets by a sea of hands. The day of the Feast of the Black Nazarene is indeed an overwhelming and touching sight of the spiritual devotion to Jesus Christ by many Catholics in the Philippines.